Homes in Adelaide are notorious for cracking, especially older buildings that used older engineering standards that may not have fully considered what kind of footings should be used for the type of soil it was being built upon. In order to combat the cracking issue underpinning is a widely used method to help close cracks and stop them from reforming. Before we get into too much detail in how to help prevent or fix cracking in these homes, it is first important to understand WHY they crack in the first place. In many cases it is simply because of the high reactivity of the soil that the house is built upon. What does high reactivity soil mean? Well the clays found abundantly in Adelaide suburbs are known for swelling up during the wet winter season and then drying out and shrinking over summer. This means the soil moves slightly with each season cycle and is classified as unstable due to high reactivity. Because of all this movement it can cause house footings to move with them as well, causing parts of your home’s floors and walls to sag and shift. In turn this can cause cracks to appear along both external and internal walls, floors can become uneven or doors may just no longer alight properly to their frames. These are all signs that the house has sagged due to the unstable soil beneath the structure. 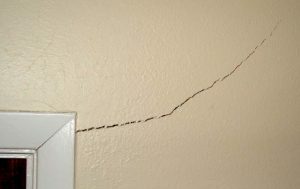 What Should I do if I Start Seeing Cracking or Other Signs of Soil Movement in my Home? So now we’ve gone over the ‘why’ but what should you do if you start seeing these signs of soil movement? The simple solution is to call for a structural engineer. It is never wise to try to judge the impact of the cracking on your own, it is always better to get sound professional advice from someone that can confirm just how bad the cracking is and whether it’s structurally significant. A qualified structural engineer can tell you not only the impact the soil movement has had to your home but also give you a detailed opinion on how to go about fixing the issue. Generally, there are simple solutions or steps you can take to minimise the cracking problems, however, on occasion it may be that your home requires a more permanent solution such as underpinning. 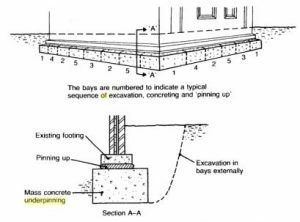 Underpinning is the process of constructing additional, stiffer footings in order to help increase the death of foundations or repair faulty footings. This is done by excavating the original footings and reinforcing them with steel and concrete. In most cases the underpin can then be used to jack up the house and make it level again. This levelling method can close cracks, unless they dislodge unevenly. However, it is easy enough to repair any remaining cracks and the underpinning should prevent them from reopening in the future. This is the most simplistic and more common method for underpinning. It requires excavating sections in sequence to a pre-established depth below the footing and then pouring the concrete mixture into each pit. Repeating the method until the entire affected area has been underpinned. However, sometimes this method is not always possible for all buildings and other methods become necessary. 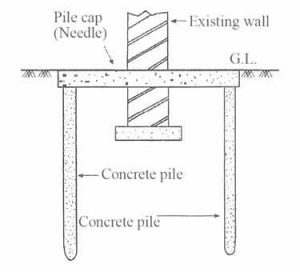 If the building must be excavated to great depths or it is just simply impractical to use a piling rig, then screw piles and brackets may be required to complete the underpinning. As long as the foundations that have the capacity to work in both tension and compression, while also withstanding wind forces, shear forces and vibrations then screw piles can be installed. 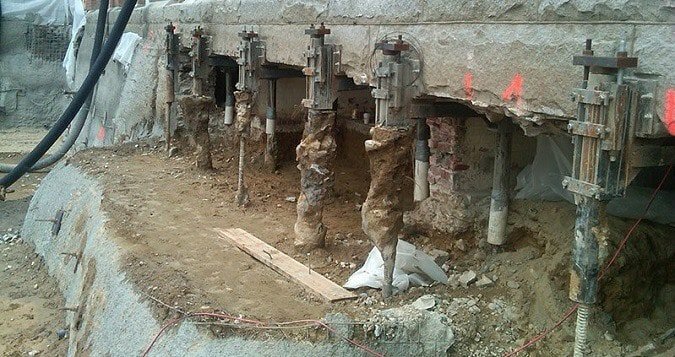 The most ideal method is to use underpinning support brackets in addition to the screw piles to ensure complete structural integrity. Once the piles and brackets are in place the structure is lifted and returned to a level position while transferring the weight of the foundation to the pier and bracket system. The main advantages to this method, over the mass pour method is that it is a lot faster to install, creates minimal vibrations that may cause damage to the surrounding area. Another method to alleviate footing is underpinning with pile and beams. This requires that on either side of the affected wall a mini-pile must be installed. Once all the piles are put in place the brickwork is removed below the wall and a reinforced concrete needle beam is used to support the wall by using it to connect the piles. The smaller the distance between the needle beams the higher the load that they can accommodate, allowing for even large structures to be underpinned as long as the piles are close enough. The total bearing capacity of this method is determined by the number, diameter, depth and spacing of the piles used and is suitable for restricted access. Other advantages of this method include that it is generally faster than traditional underpinning, it has incredibly high load capability and there is less disruption to the site. In the rare case that a whole structure requires underpinning, a piled raft must be used. It is usually recommended when either foundations are too deep for other underpinning methods or in areas where the soil is so hard that small equipment can not excavate up to the required depth. In this method the loading conditions are taken into consideration and the pile locations are determined and put in place. Then pockets below the footings are broken and reinforced needle beams are placed in order to bear the wall’s load. The needle beams are then all linked with a rank of beams and the structure is poured with concrete. This system is advantageous as it provides lateral and traverse ties throughout the entire structure, there is no need for external access, it reduces disruption to drainage systems and is considered more economical at depths greater than 1.5m.